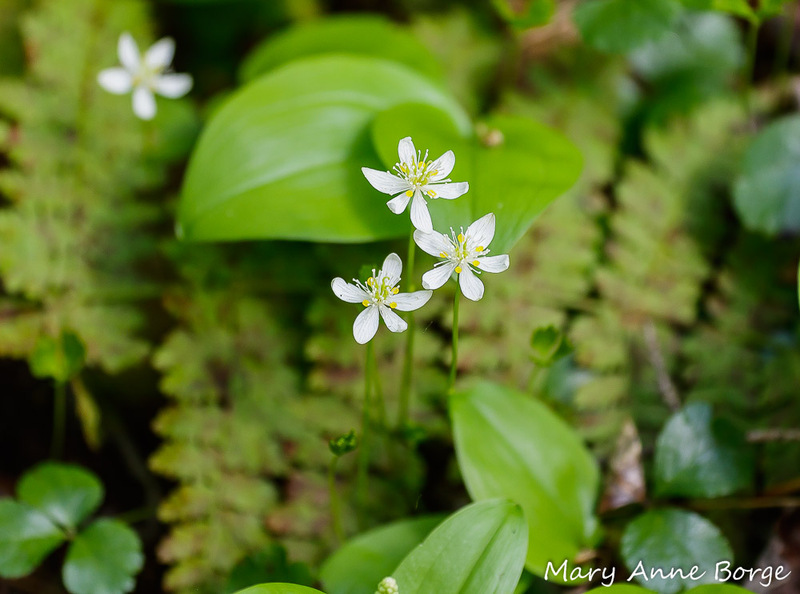 In spite of the weather whiplash we’ve experienced since late February, spring wildflowers are slowly, cautiously beginning to emerge and bloom. 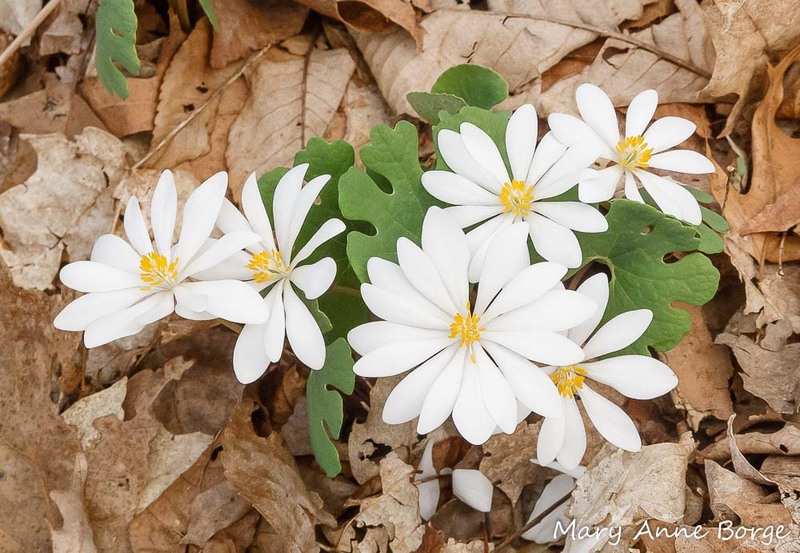 One of the first spring blossoms I saw this season was Bloodroot (Sanguinaria canadensis). The sight of this stunning white blossom holding its face up to the sun was especially welcome after a snowy, chilly March. 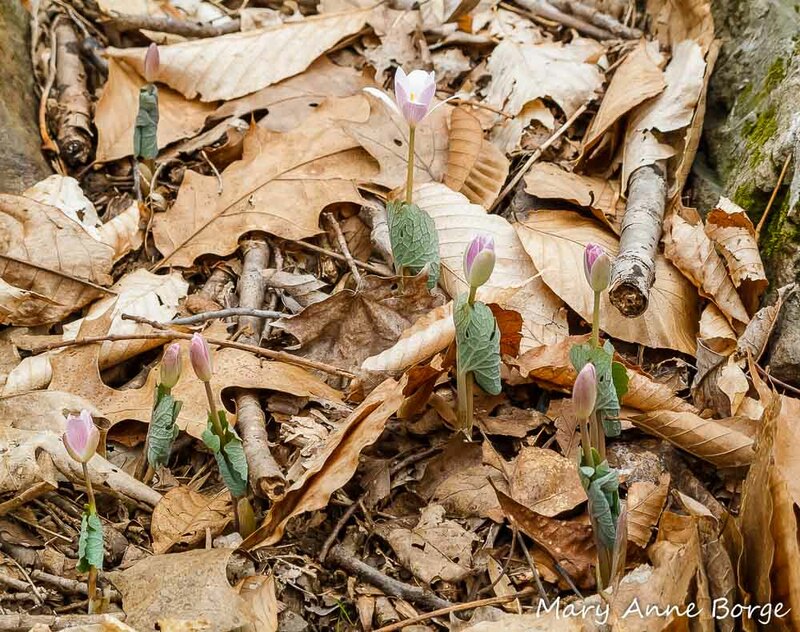 With each sunny day more flower shoots make their way through their winter blanket of fallen leaves. 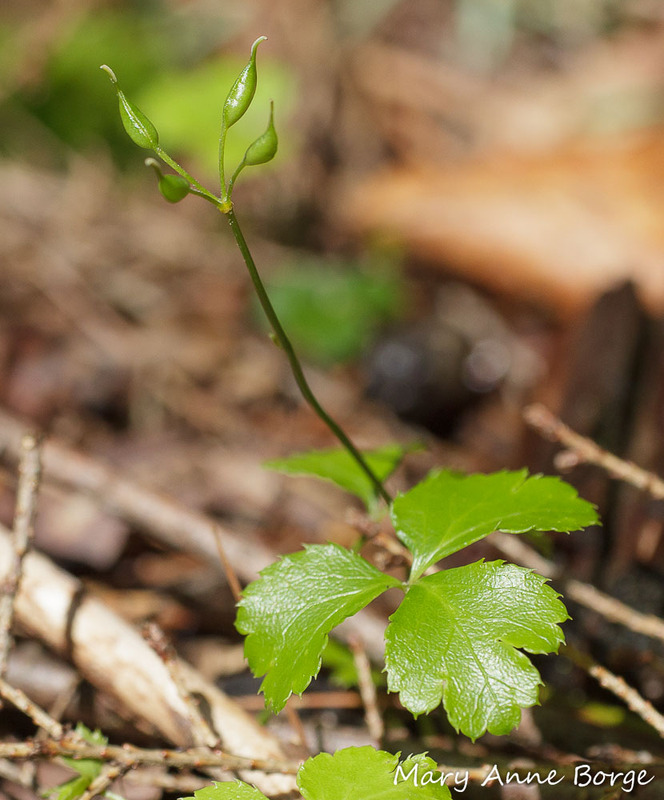 As Bloodroot emerges, it leads with a flower stem, each one wrapped by a single leaf. The flowers open as the temperatures warm, advertising their presence to early flying pollinators. 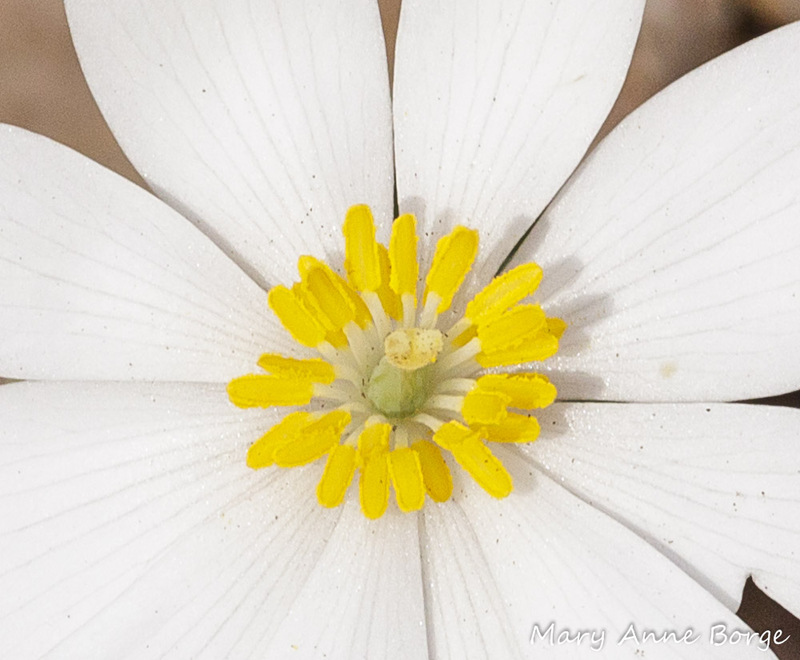 The veins in the pure white petals, contrasted with the yellow stamens surrounding the pistil in the center of the flower make a perfect target for foraging pollinators. The stamens are the male reproductive parts, the pistils are the female reproductive parts. 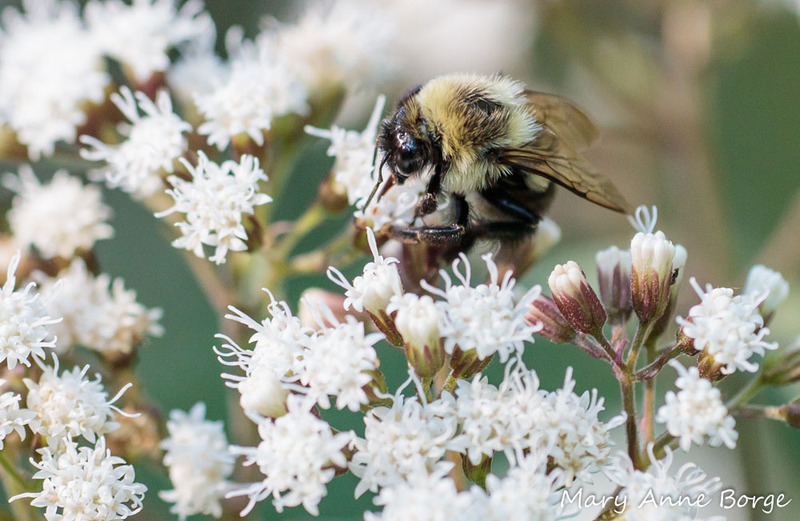 The most likely flower visitors are early flying bees or flies that can tolerate low temperatures. Each plant species evolves to utilize its energy to maximize the chances of survival and reproduction. 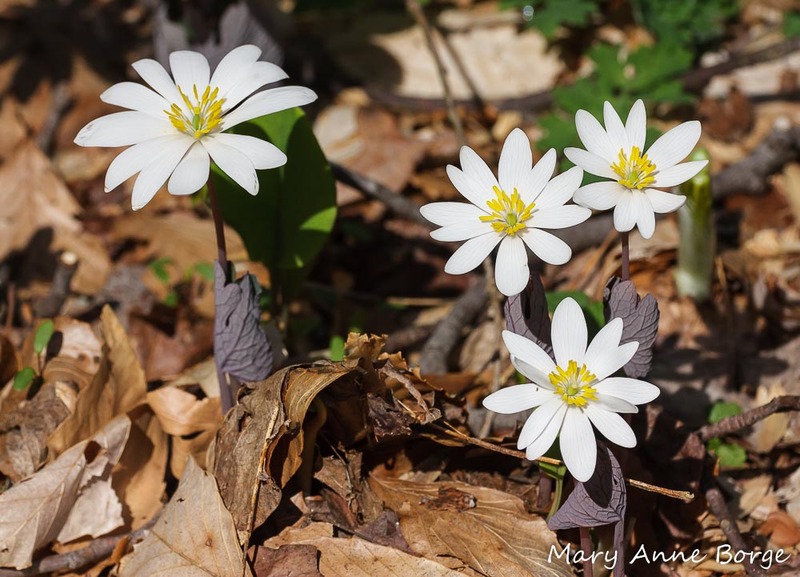 Like Hepatica and some other early spring flowers, Bloodroot’s strategy is to produce an enticing floral display whose only reward is pollen; the flowers don’t produce nectar. 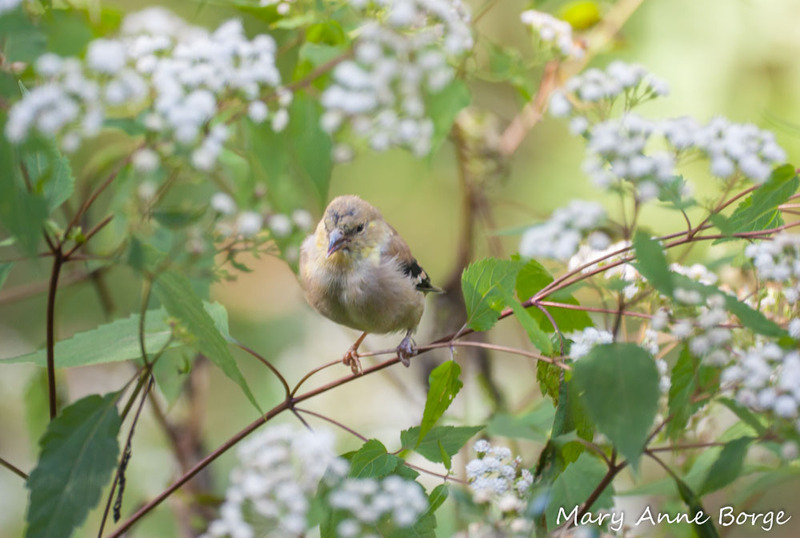 This works, because pollen is an important food source for many of the insects active at this time of year. 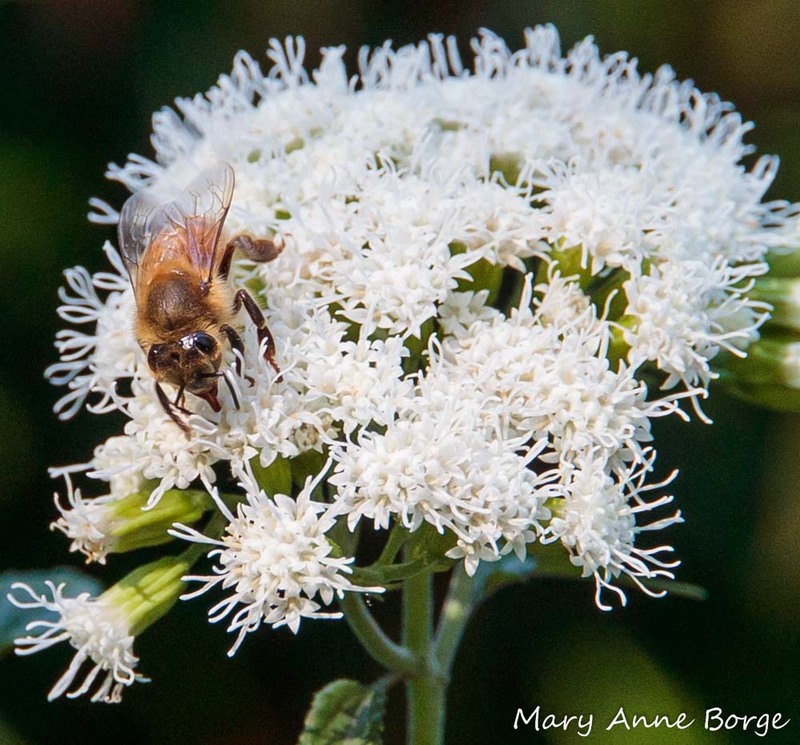 Bees consume pollen, and female bees also collect it to feed their larvae. 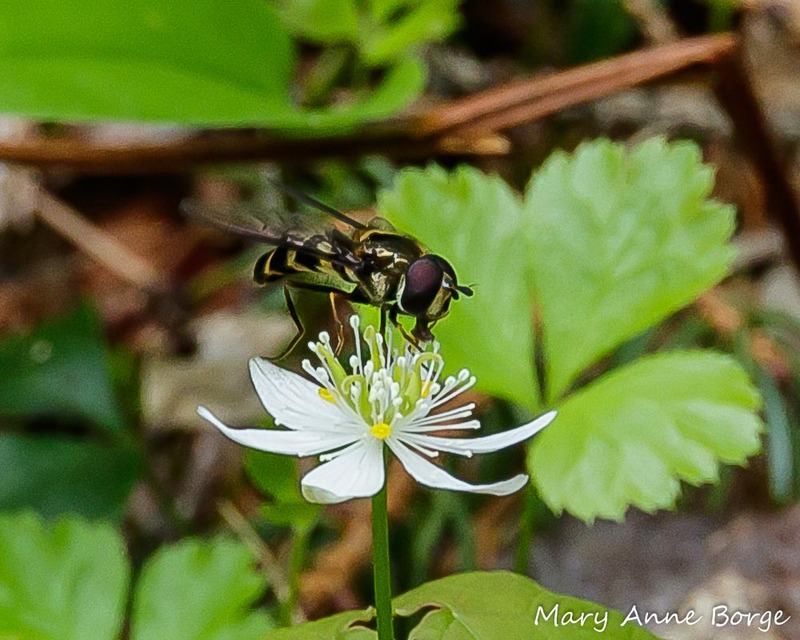 Flies and beetles visit flowers for their nutritious pollen. 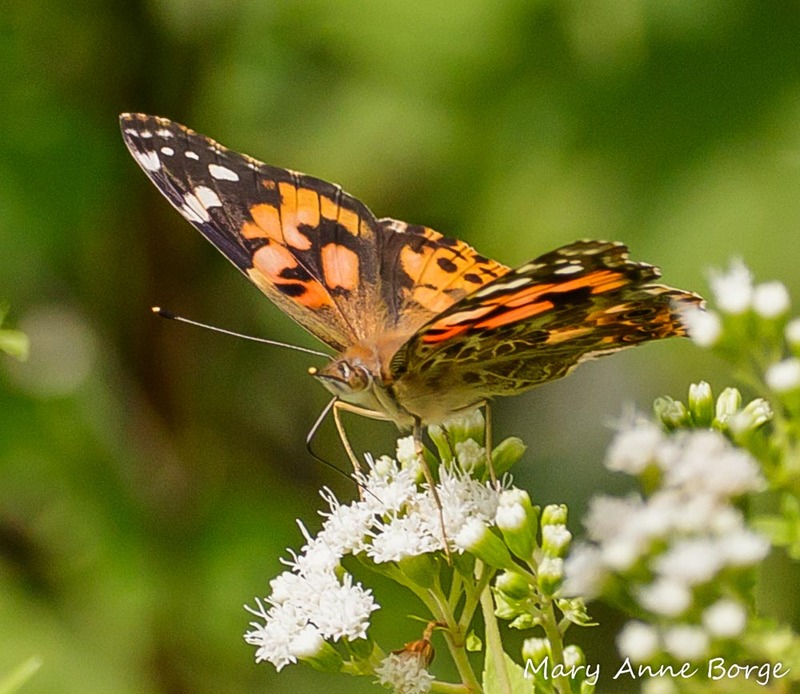 Not many of the insects that prefer nectar, like butterflies, are active at the time Bloodroot is blooming, so there would be little added benefit in offering it. 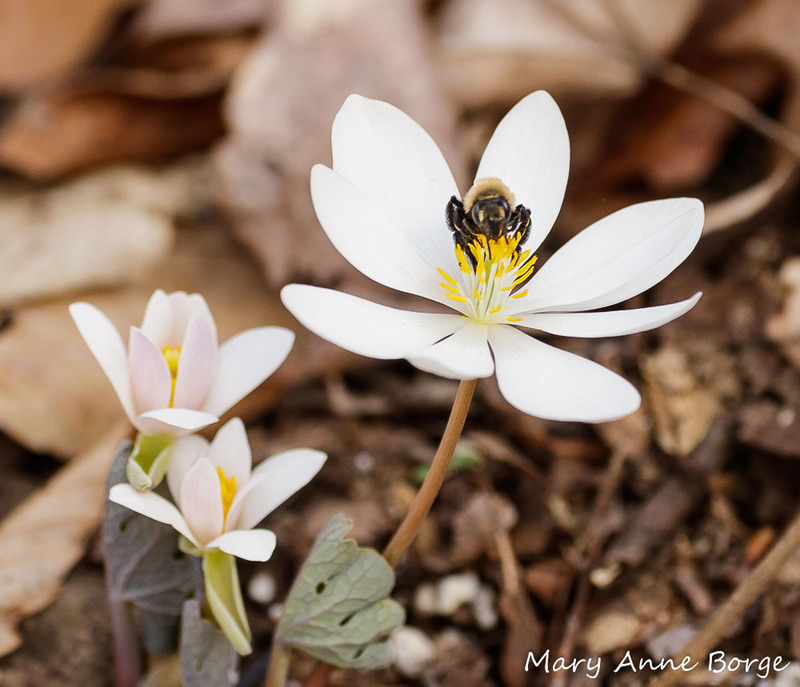 As unpredictable as spring weather is, even the hardiest insects may not always be available in the short window of time a Bloodroot flower is open for business. Each flower remains open for about three days, closing at night and on rainy days to protect its pollen when insects are unlikely to be active. 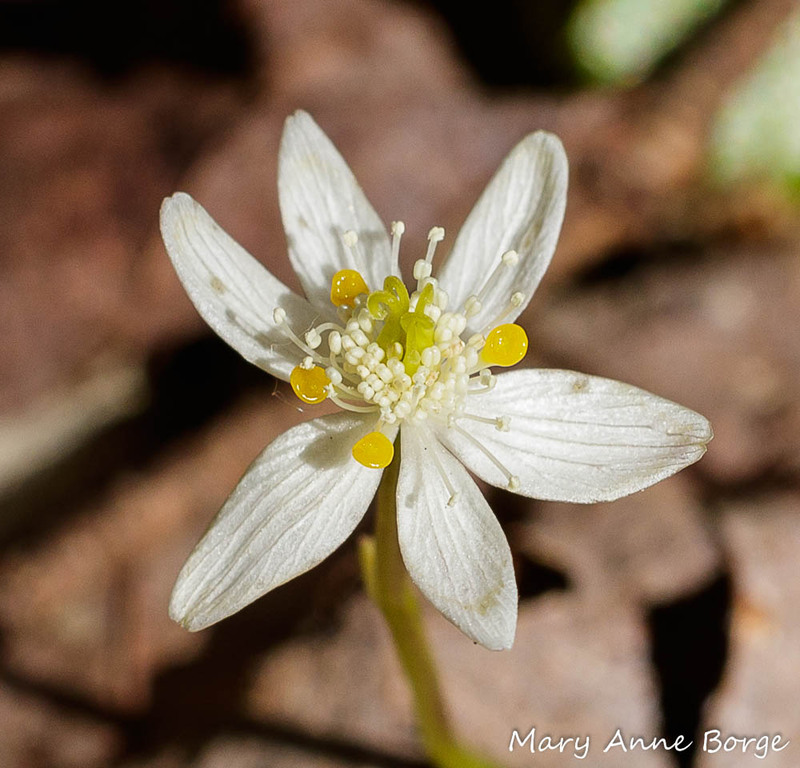 When a Bloodroot flower opens, its stigma, located at the tip of the pistil, is receptive. 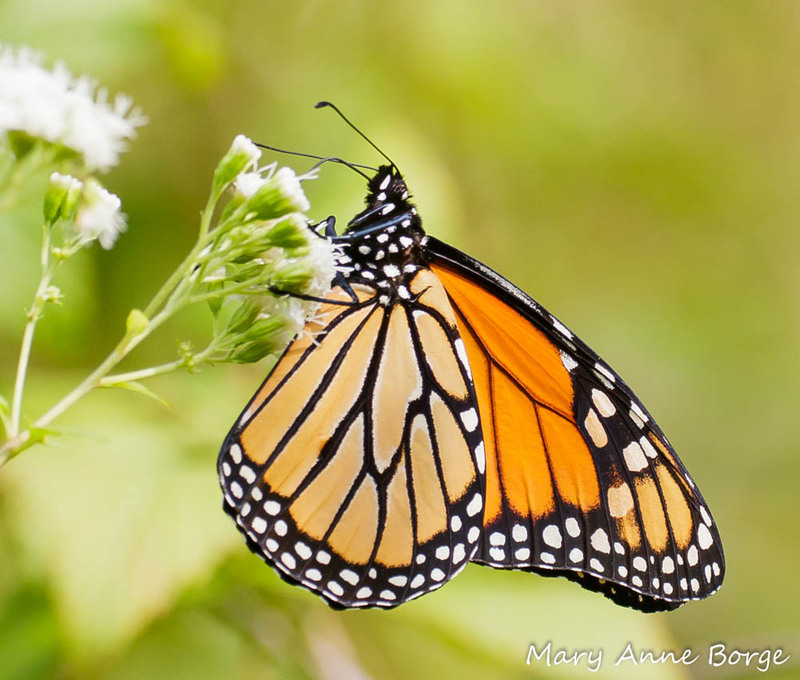 Pollen must be deposited on the stigma in order for pollination to occur. At this time, the stamens are curved away from the stigma to clear the way for an insect’s access to the receptive stigma, hopefully bringing pollen. After a few hours, some of the anthers, located at the tips of the stamens, begin to dehisce, or open, making pollen available. 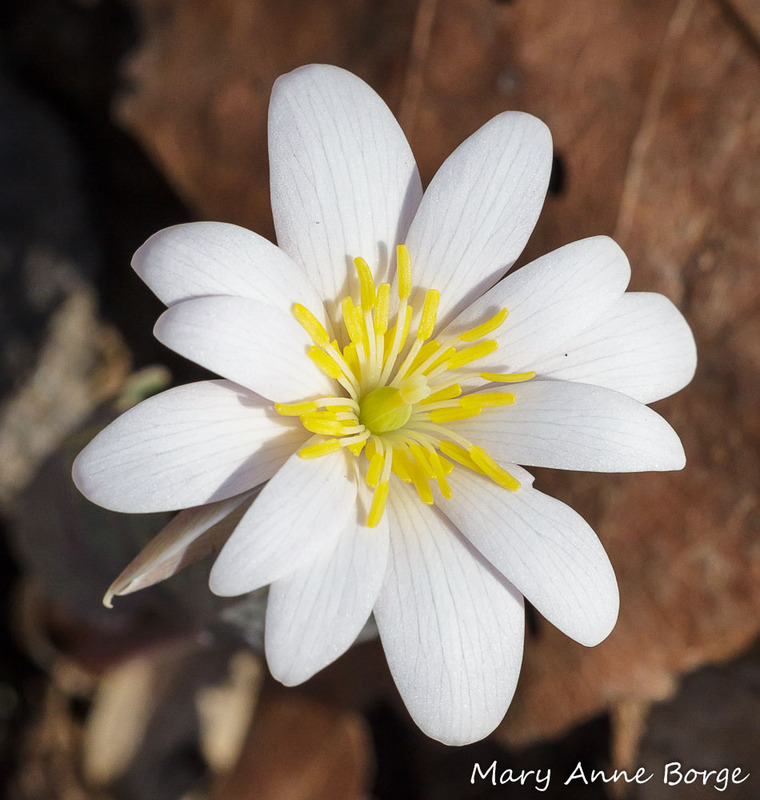 The remaining anthers open gradually over the three-day period that Bloodroot flowers are typically open. 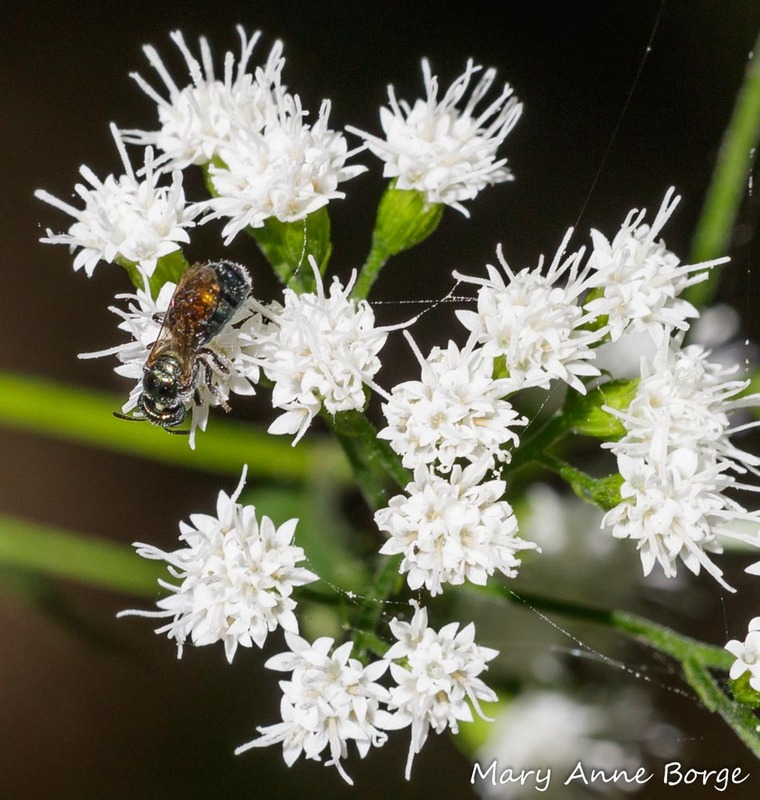 The continuing separation of the anthers from the stigma helps minimize the likelihood of self-pollination. 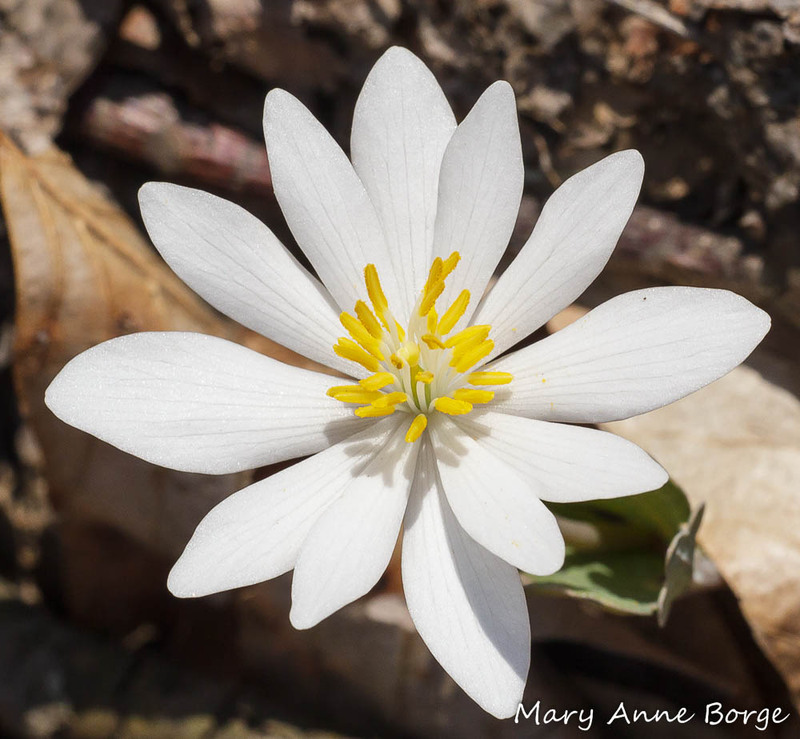 Bloodroot (Sanguinaria canadensis) flower. Notice the pollen around the edges of the anthers where they have opened to make pollen available. If after three days the flower has not been pollinated with the assistance of an insect, the stamens will begin to curve inward toward the center of the flower. The anthers touch the stigma, depositing the pollen. In Bloodroot’s world, it’s better to self-pollinate to ensure reproduction than not to reproduce at all. The flower drops its petals within hours of pollination. 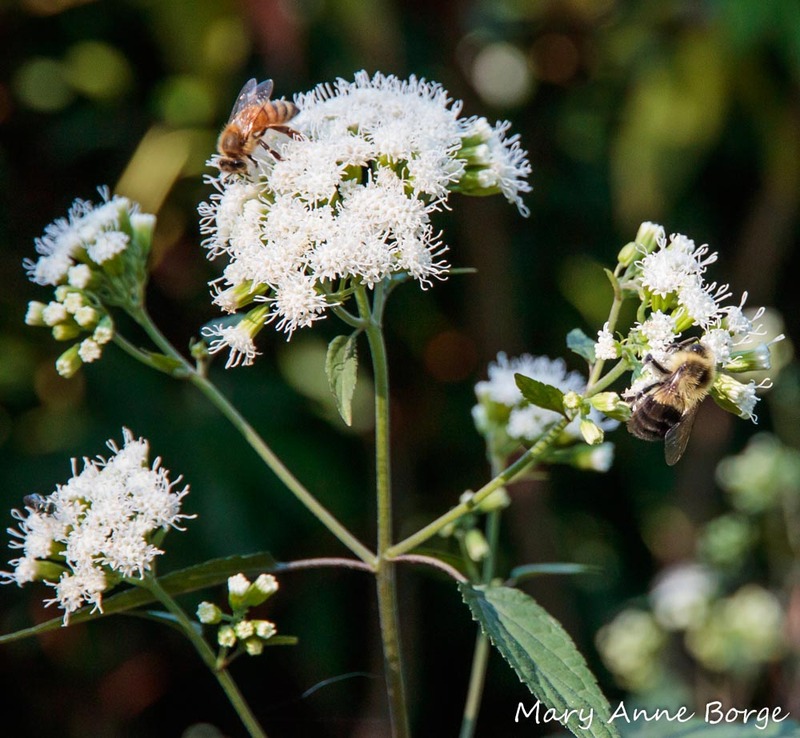 After pollination, the thick, almost succulent leaves that protected the flower stem gradually open, expand, and capture energy from the sun for several more weeks. 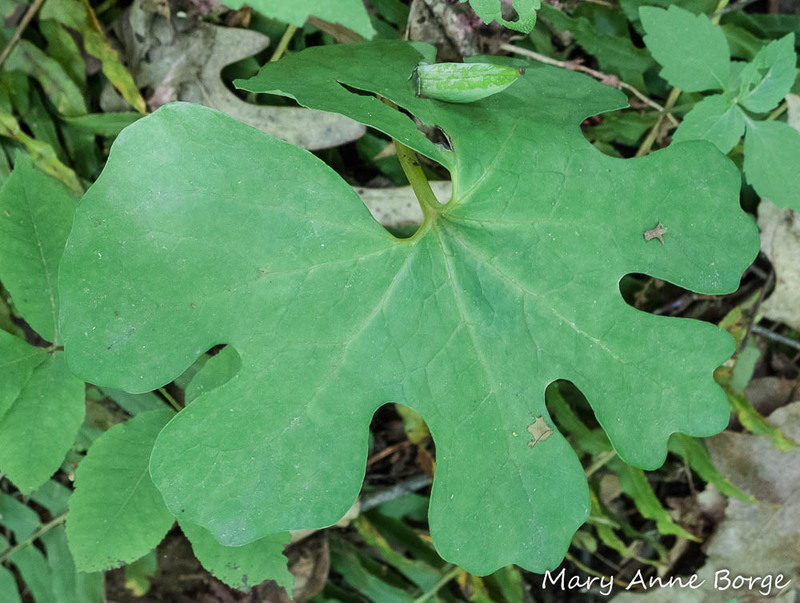 Bloodroot (Sanguinaria canadensis) leaf in late spring. the leaf will continue to photosynthesize for much of the summer. 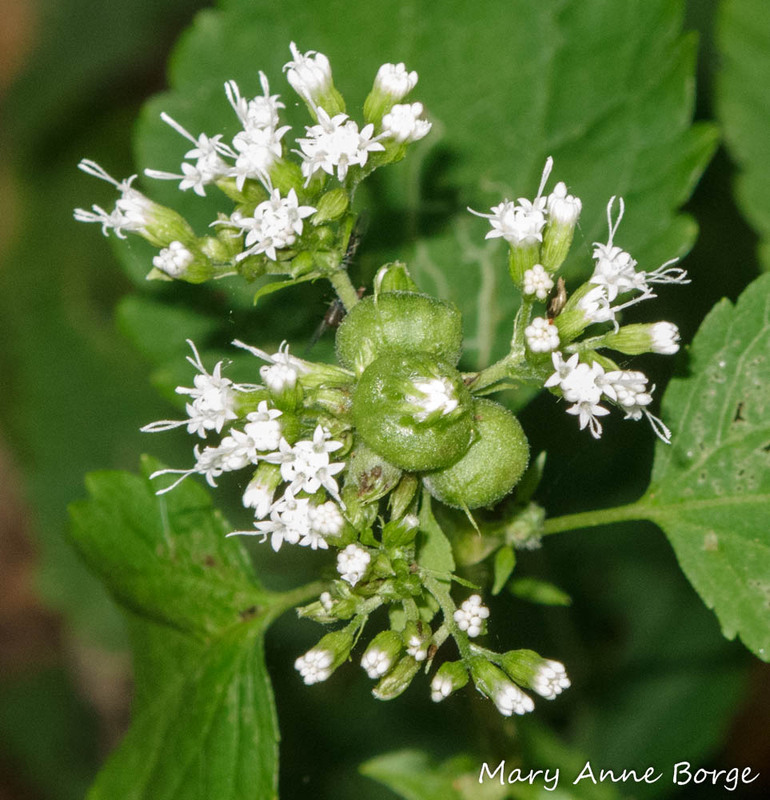 Pollinated flowers produce a fruit capsule that develops under the protection of the expanding leaves. The capsule splits open when it’s ripe, making the seeds inside available for dispersal. 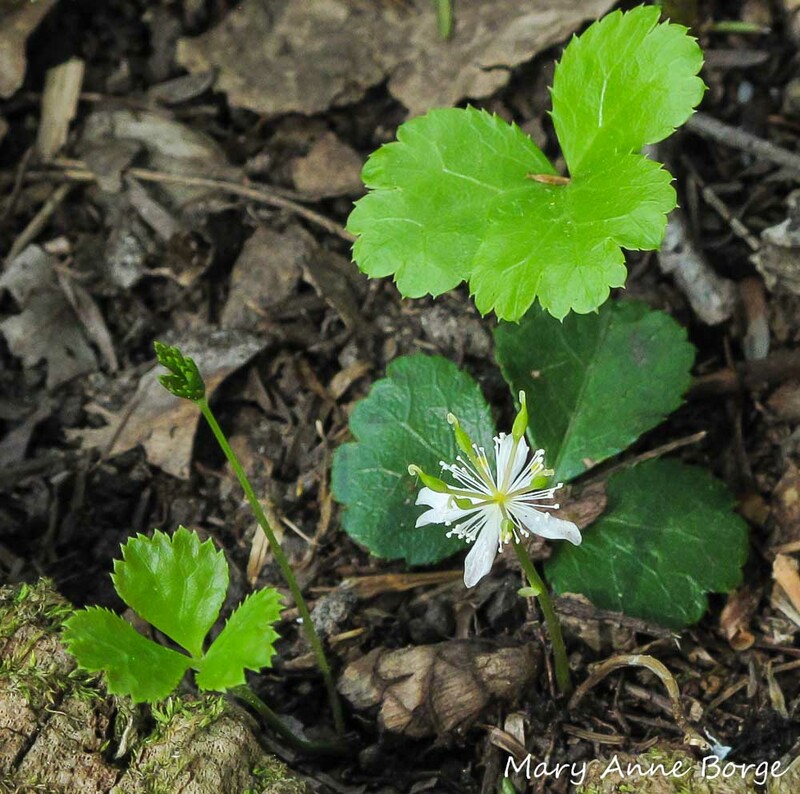 Like many early spring blooming wildflowers, Bloodroot has evolved to partner with animals, in this case ants, to disperse its seeds. Each seed has a packet of food called an elaiosome attached. The elaiosome’s chemical make-up mimics the nutrition of insects, a preferred food for ants. The ants take the seeds to their homes, where they eat the elaiosome and discard the seed, effectively planting it. 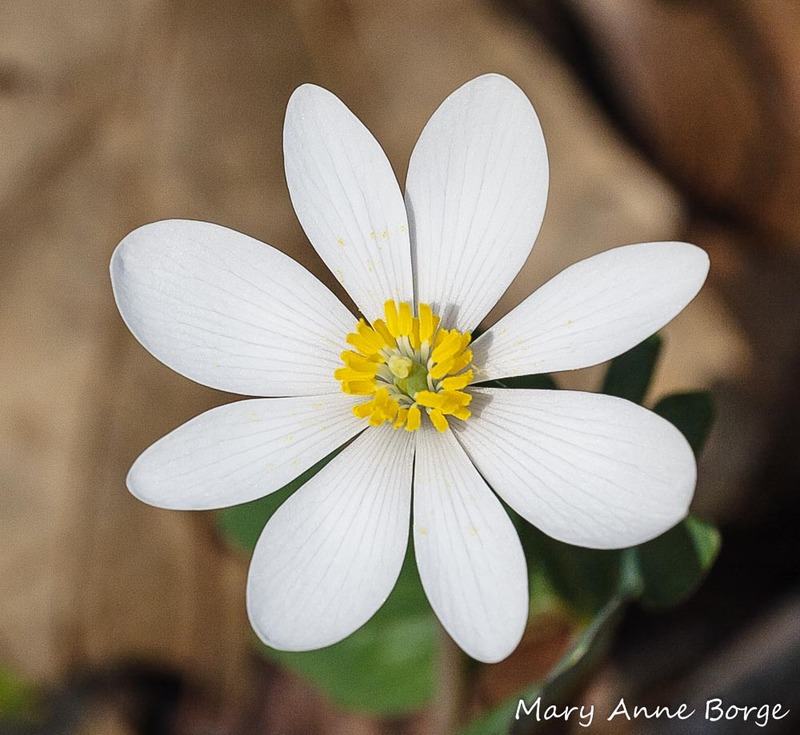 Both the common name, Bloodroot, and the genus, Sanguinaria, refer to the color of the sap found in the plants’ foliage and rhizomes (the plants’ underground parts). 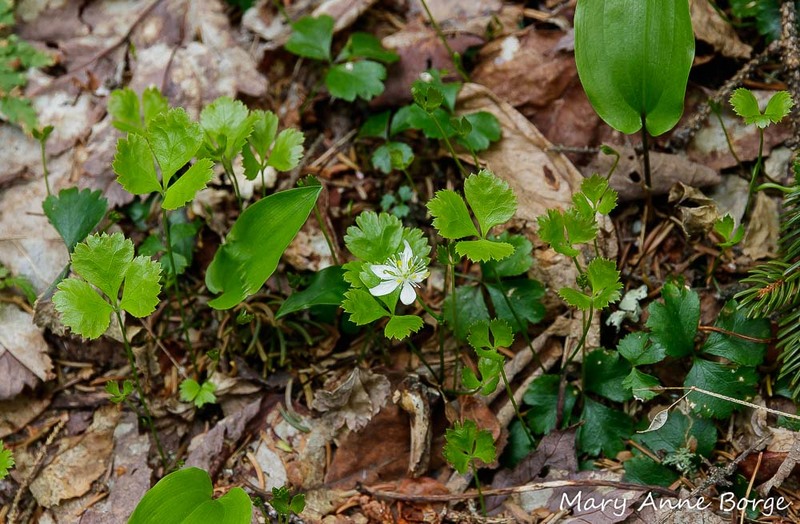 This sap contains chemicals with a narcotic effect that Bloodroot produces to protect itself from herbivores. This is a common and highly effective strategy of the Poppy (Paperaceae) family, of which Bloodroot is a member. As a result, Bloodroot does well even where there is serious deer pressure. 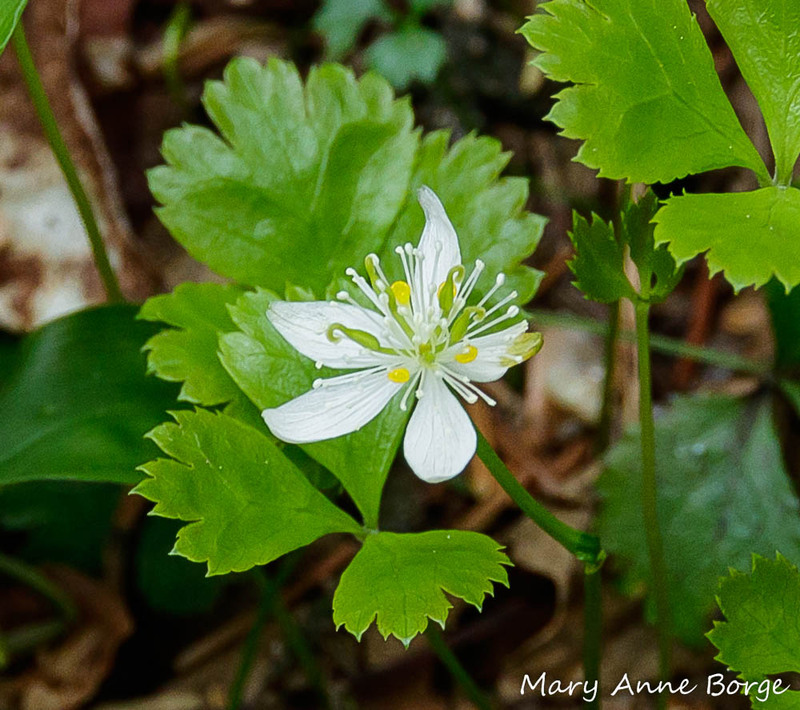 Native Americans have used Bloodroot for many medicinal purposes. 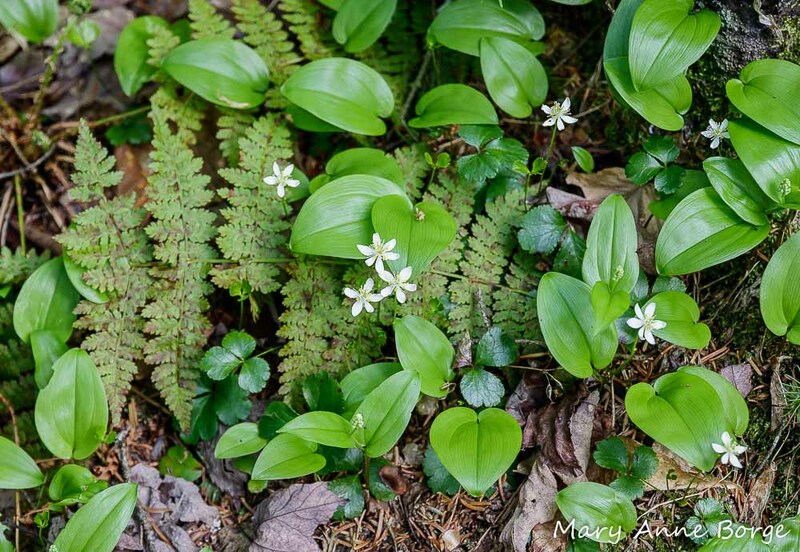 One of the chemical constituents of Bloodroot, sanguinarine, has also been used commercially in toothpaste and mouthwash to help prevent gingivitis. 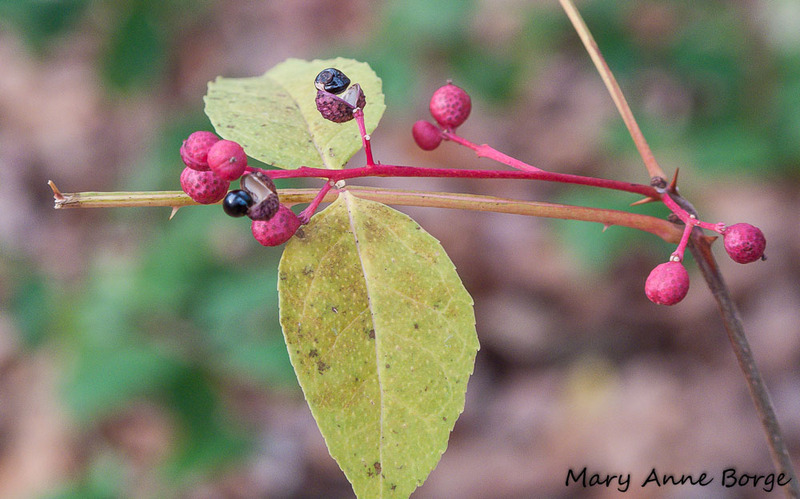 The red sap is also used as a dye. 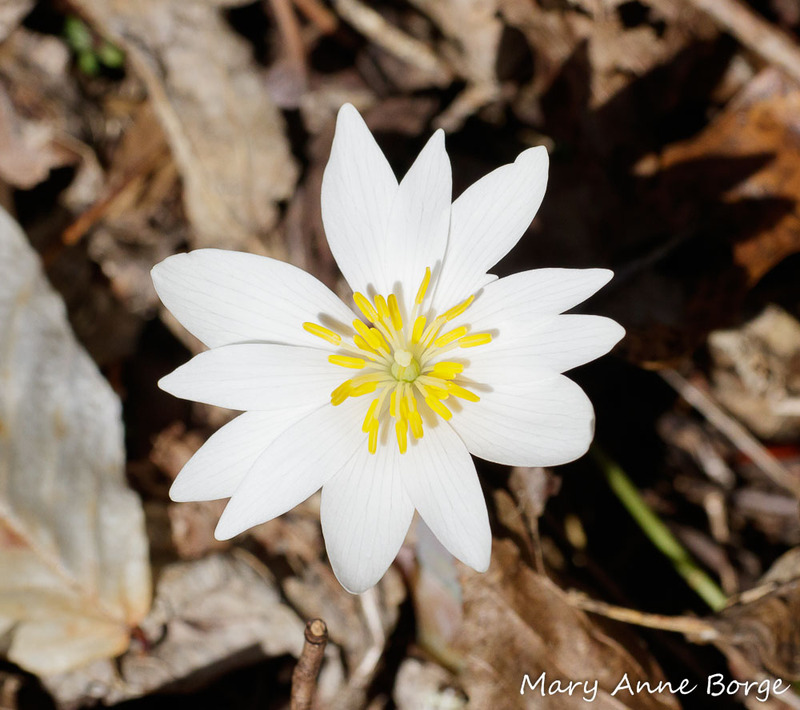 Bloodroot can be found in rich, deciduous woods throughout much of the eastern two-thirds of the United States and Canada. 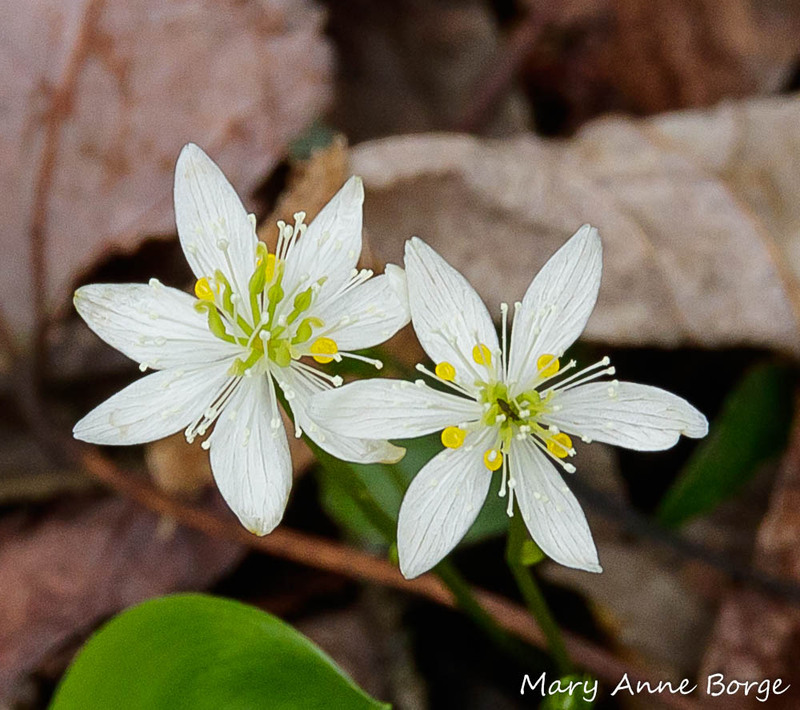 Look for it and other spring wildflowers along a wooded trail near you! A Carpet of Spring Beauty, Woven by… Ants! 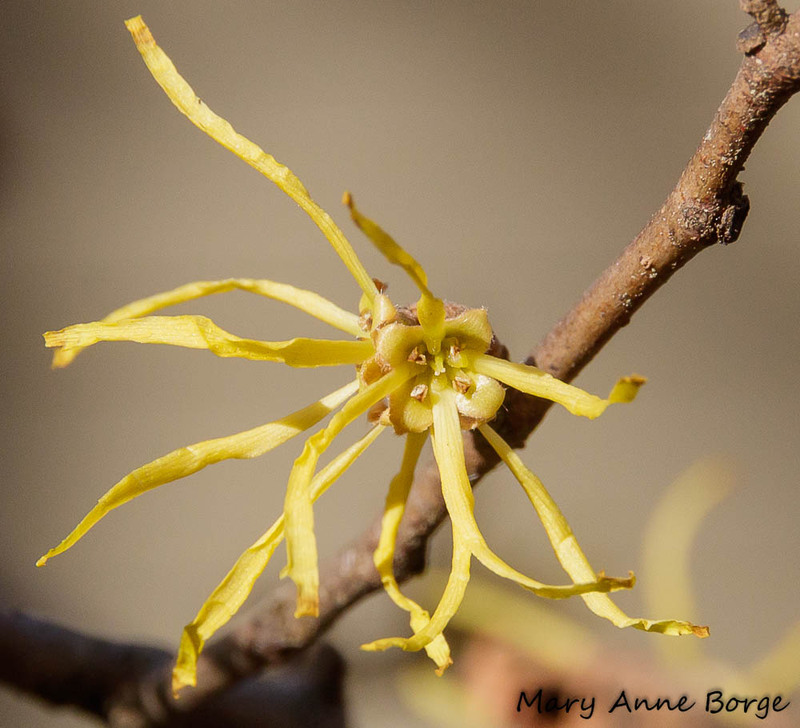 It’s well into December, and American Witch-hazel (Hamamelis virginiana) is still in bloom, brightening our winter shade garden and the woodland understory. The flowers are arranged in clusters, usually in threes. Each flower has four long, spidery, streamer-like petals. In the center of the flowers, you can see other flower parts that also come in fours. Four stamens (male reproductive parts) are tucked in between the petals, protected from below by the four sepals that protected the flower until it was ready to open. The pistils (female reproductive parts) can be seen in the very center of the flowers. Witch-hazel (Hamamelis virginiana) flower beginning to bloom. The anthers have not yet open to release pollen. Witch-hazel (Hamamelis virginiana) flower beginning to bloom. The anthers have opened to release pollen. 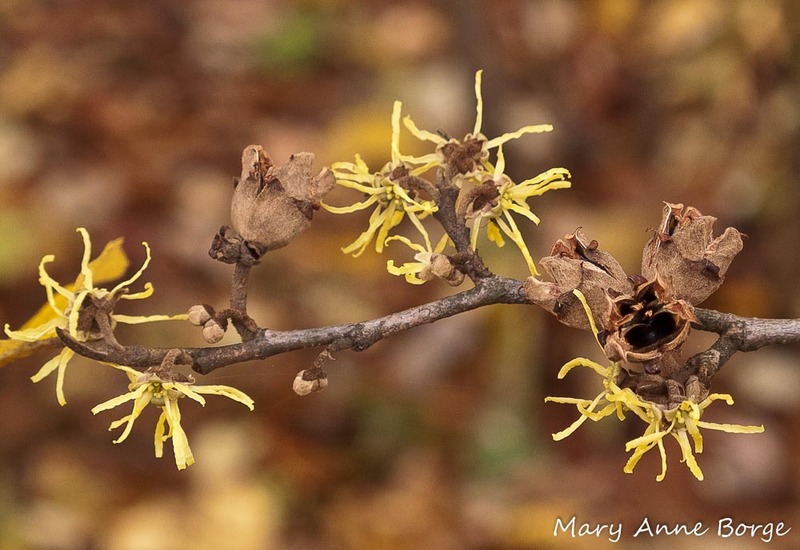 Even though Witch-hazel blooms when the weather is cooler, it relies primarily on insects for pollination. 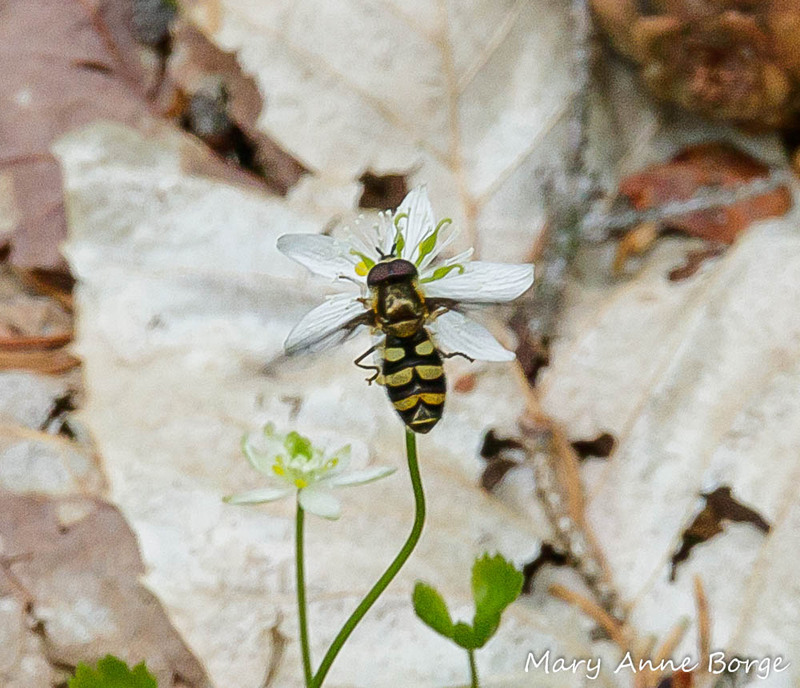 Various fly species are the most frequent flower visitors. This is not too surprising, since many flies are active at fairly low temperatures. 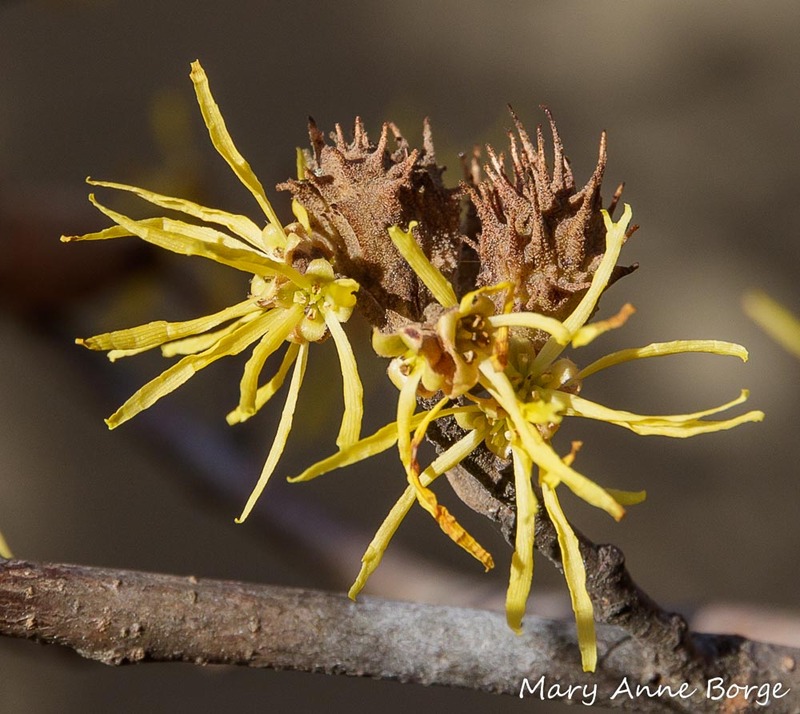 Several species of bees, small wasps, moths and even beetles have also been documented as potential Witch-hazel pollinators. They are attracted by the color of the petals, a mild (to me, at least) fragrance, and the fact that there is not much else in bloom. 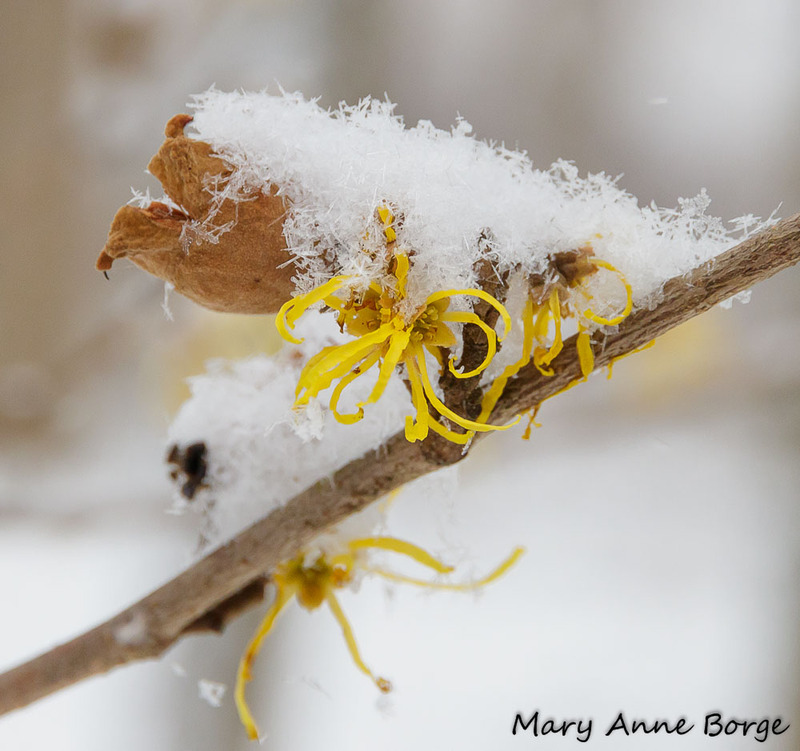 If the weather doesn’t cooperate and not enough insects are active, witch-hazel is capable of self-pollination, although cross-pollination with the assistance of an insect is preferred, since this produces a stronger genetic result. Fertilization is delayed until spring, after which fruits begin to develop. Even during and after our first snowstorm of the season with about 5 inches of wet snow, these tough little flowers hung on, looking as fresh as ever. 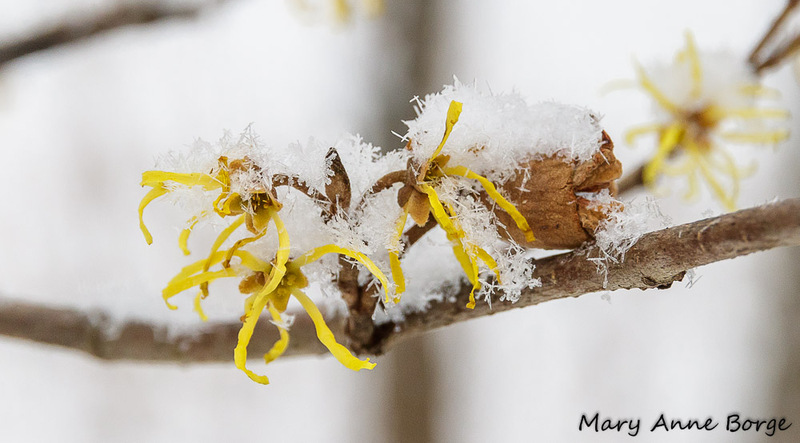 Witch-hazel (Hamamelis virginiana), still blooming in spite of the snow. Such tenacity can pay off. 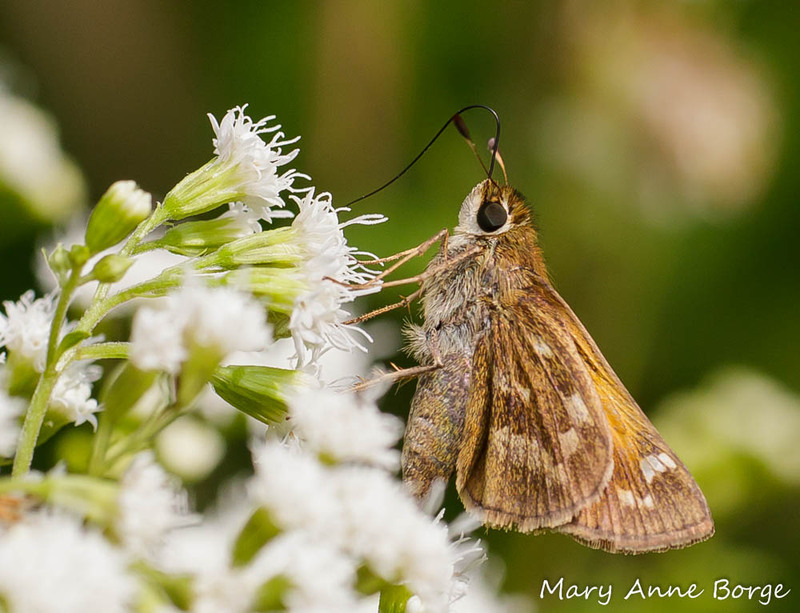 While looking at the flower photos that I took during the storm, I found a moth taking refuge on a branch near the flowers, waiting for the temperatures to warm up enough to become active and search for nectar. 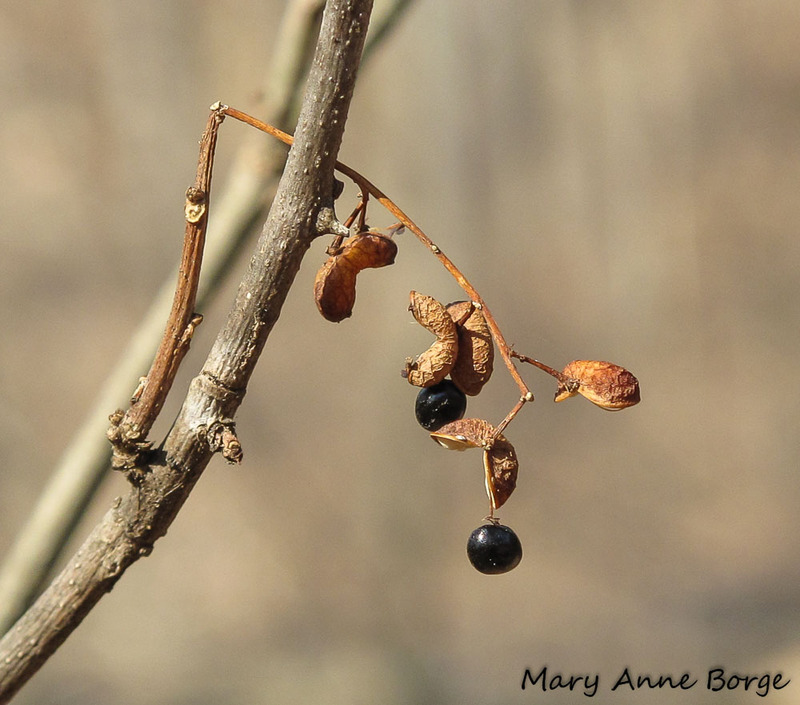 That little moth could make a nice snack for a Chickadee and Titmouse searching the seemingly baren winter branches. 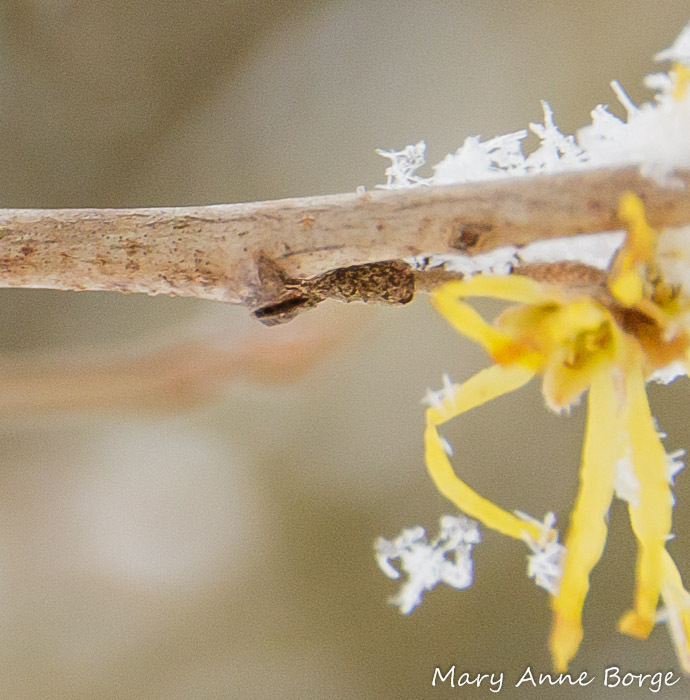 A moth sheltering on Witch-hazel (Hamamelis virginiana) during a December snow storm. The flowers are accompanied by fruit capsules that look like small flowers carved from wood. These fruit capsules are the product of the previous year’s successfully pollinated flowers. In early October, as the leaves began to turn from green to yellow, the fruit capsules and flower buds were still tightly closed. 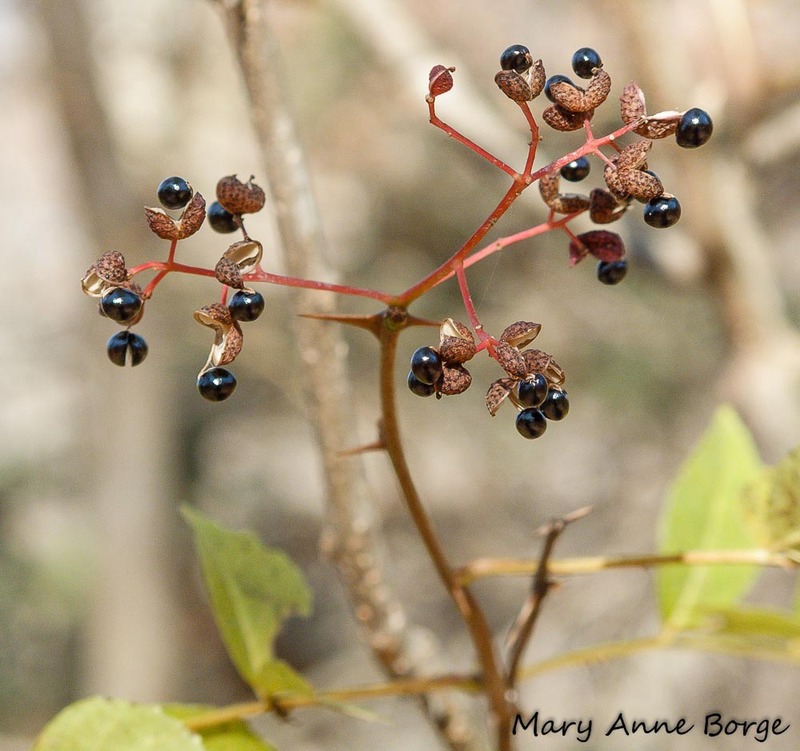 As this season’s flowers began to bloom, the fruit capsules opened explosively, ejecting the seeds several feet away. The seeds will wait through two winters before they germinate. Ruffed Grouse, Northern Bobwhite, Wild Turkey, as well as some rabbits and squirrels eat the fruit. 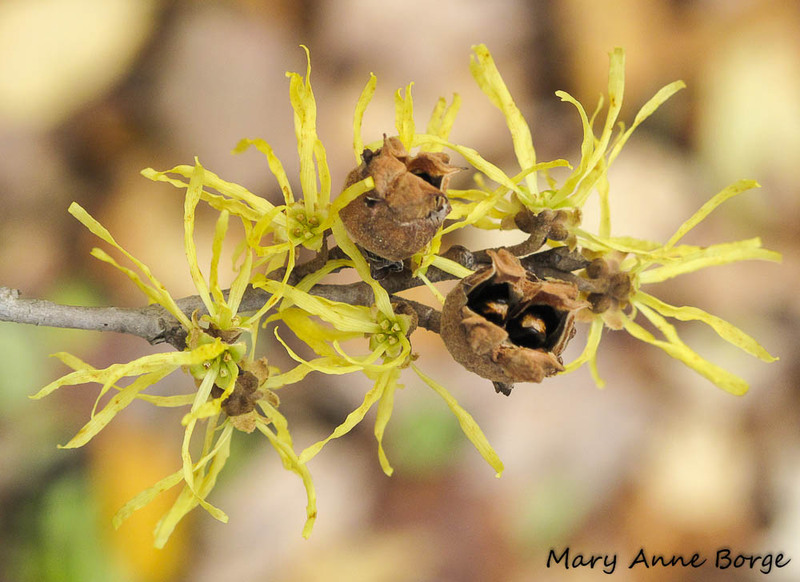 Witch-hazel is well-known for its use as an astringent and anti-inflammatory agent. You may have a bottle in your medicine cabinet now. 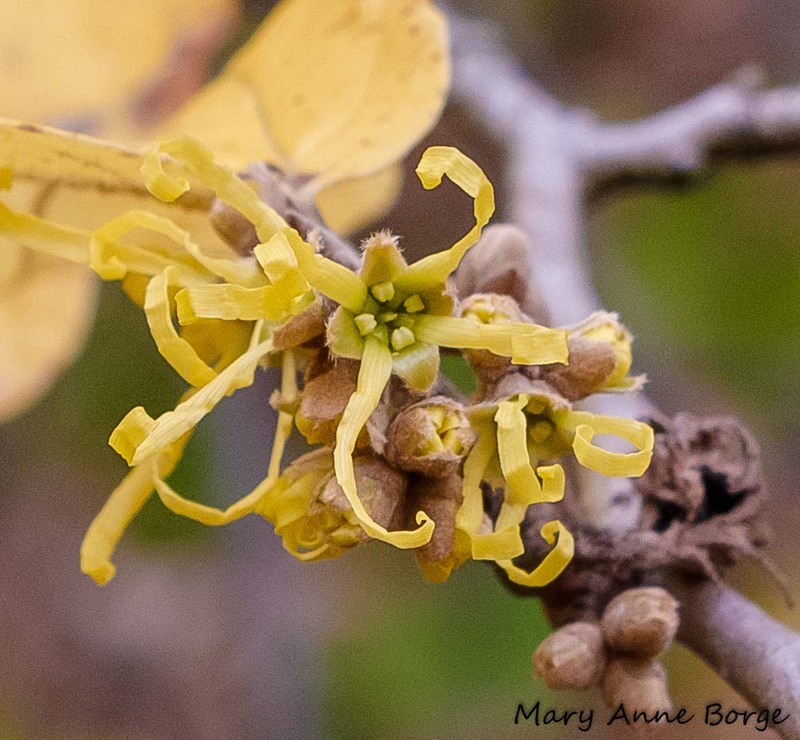 Witch-hazel is used to treat wounds and hemorrhoids, and it’s an ingredient in some cosmetics. It acts as a styptic to stop bleeding, and reduces bruising and inflammation. It also helps reduce the chances of infection. It’s not by accident that Witch-hazel has these properties. 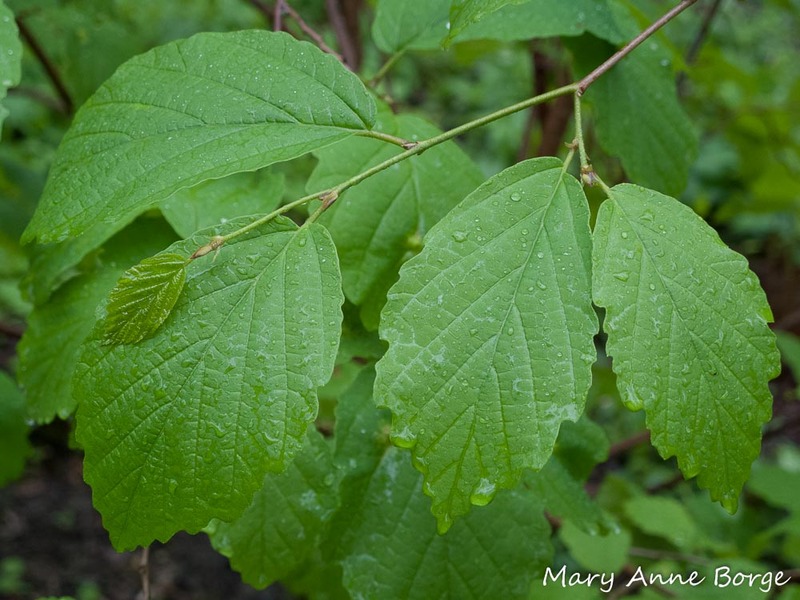 The tannins found in the leaves and inner bark of Witch-hazel provide these benefits. 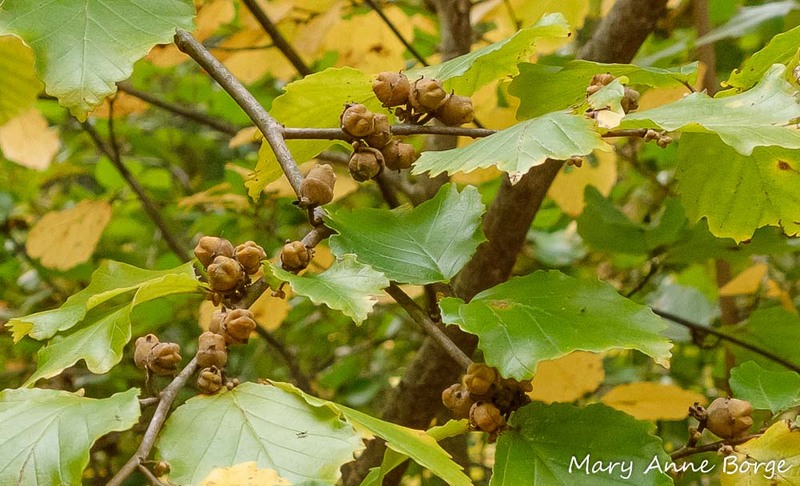 Witch-hazel produces these compounds as protection from herbivores, and to inhibit the growth of fungi and bacteria that might be harmful to the plant. Fortunately for us, humans can also benefit. 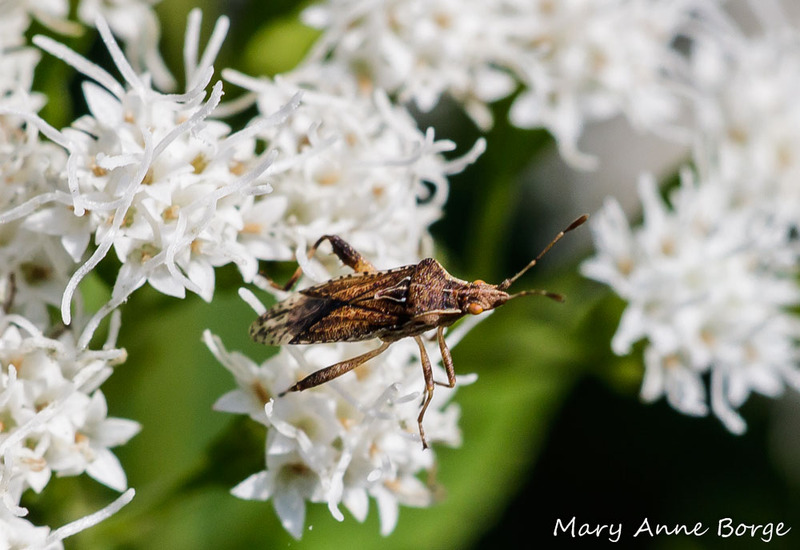 The spiny witch-hazel bud gall aphid (Hamamelistes spinosus) is named for the appearance of the gall the plant produces from bud tissue in response to being used as a home by the developing aphids. At this time of year, the gall looks woody. At a quick glance it might be mistaken for a fruit capsule, until you notice the spines. Earlier in the season, the spiny witch-hazel bud gall is green and fleshy. Spiny Witch-hazel bud gall, with ants. What’s the attraction? It’s interesting that there are so many ants swarming this gall. If the gall were open and the aphids were available, the ants would likely be milking them for delicious ‘honeydew’ (excrement). But the aphids have not reached maturity, they are still safely encased inside the gall. Ants are often very beneficial to plants. 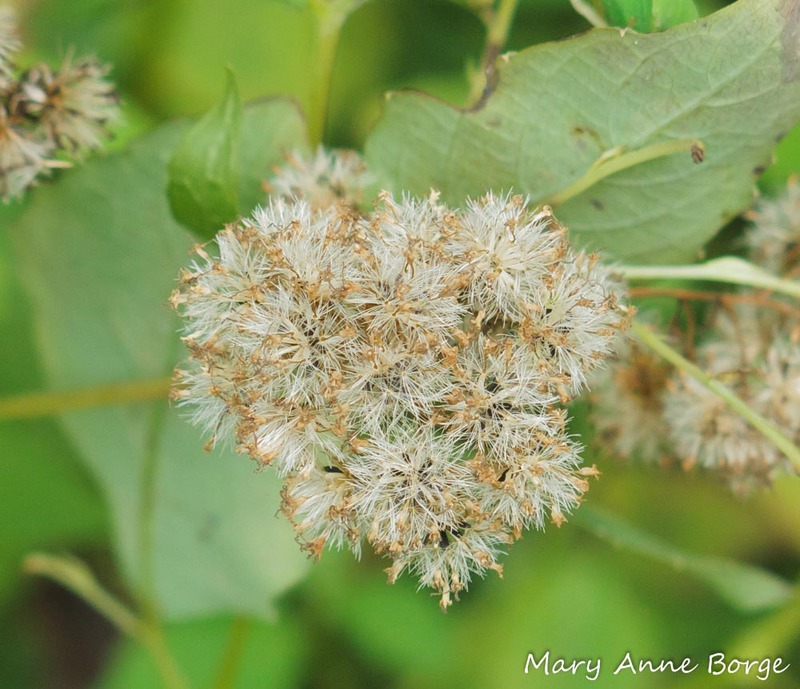 They disperse the seeds of many spring blooming wildflowers, for one thing. 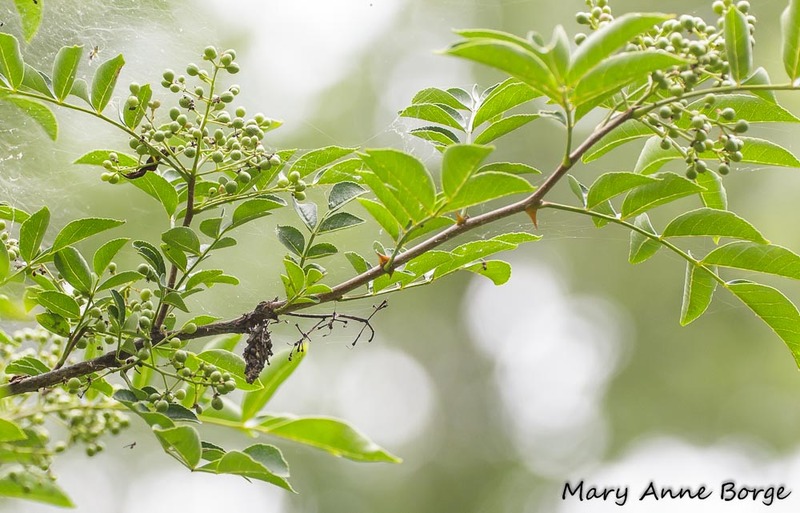 Ants also provide protection from herbivores like caterpillars who might eat a plant’s leaves, flowers or buds, because other insects are an important part of an ant’s diet. 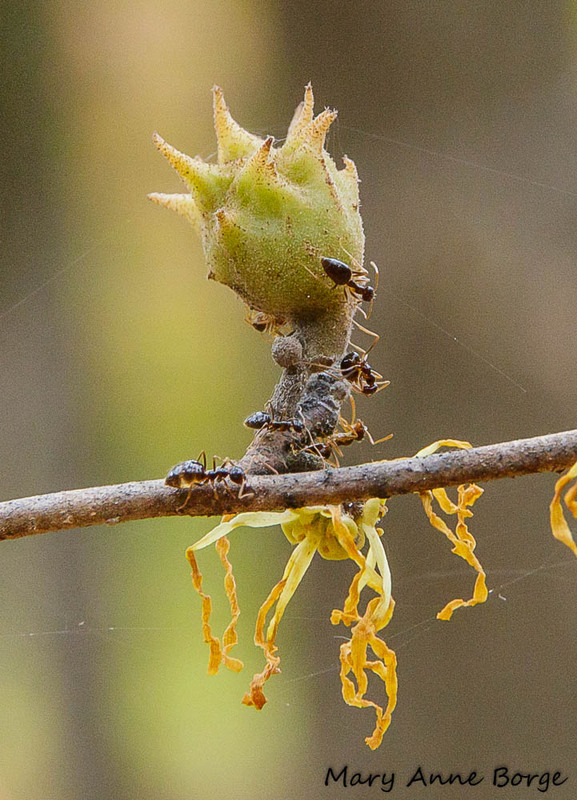 Plants often emit a chemical call to arms to alert ants and other predators to the availability of insect food. 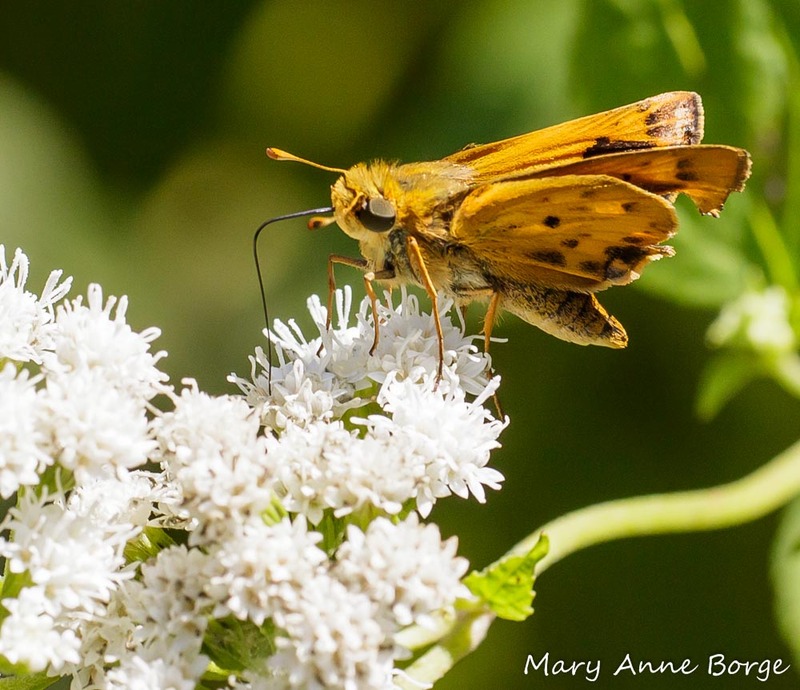 The plant may offer an additional reward and reason to stick around in the form of nectar not associated with flowers (extra-floral nectaries) or resins, specifically aimed at payment to their protectors. It’s a mystery to me what caused the ants in this photo to visit. Maybe this Witch-hazel detected the presence of a new generation of insect eggs (not visible to me), and sent out a distress signal to the ants. Any other ideas? 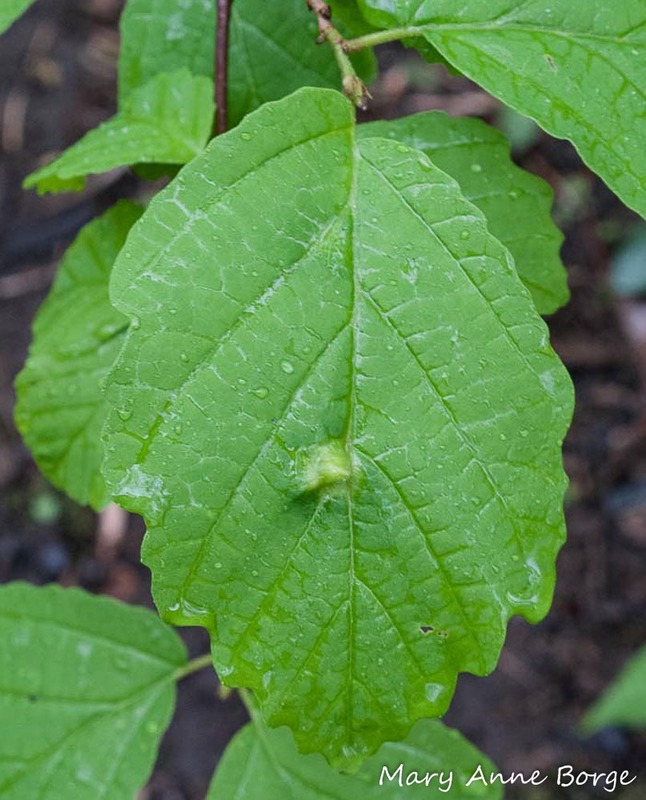 Pristine leaves unfold in spring, but they are often quickly put to use as food and shelter by another aphid (Hormaphis hamamelidis), the Witch-hazel leaf or cone gall aphid. This gall resembles a cone, or a witch’s hat. 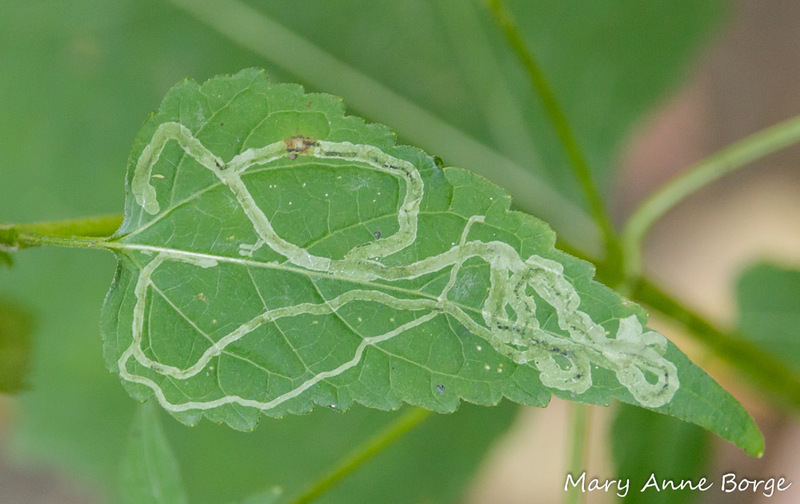 Both of these aphids spend part of their life cycle on birch trees. 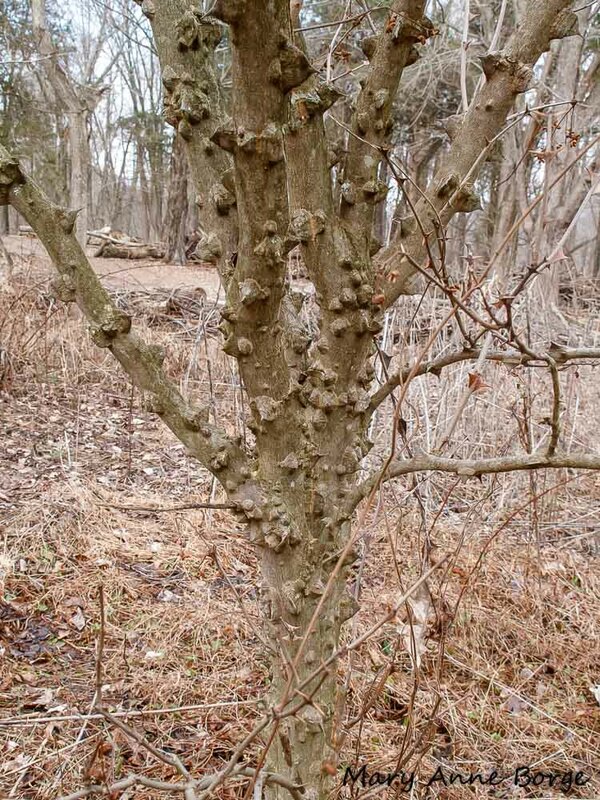 Witch-hazel branches have been used as divining rods to find underground water sources, a practice sometimes referred to as ‘water witching’. 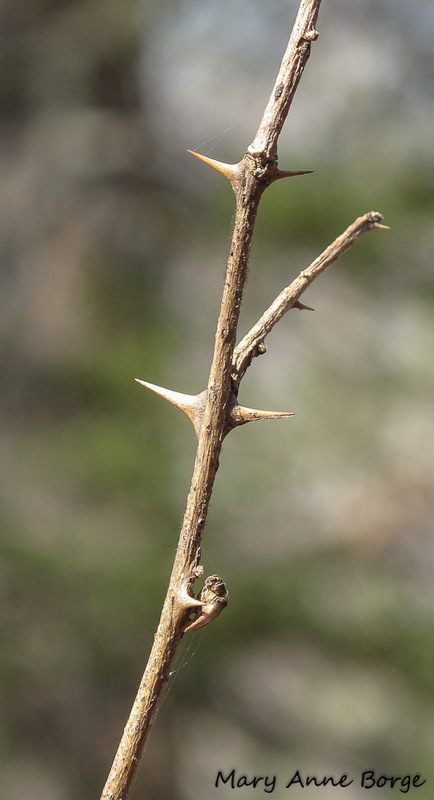 In theory at least, the branch would point or bend towards the ground when it detected water. The ‘Witch’ in ‘Witch-hazel’ is based on an Anglo-Saxon word, ‘wych’, that means ‘bending’. Witch-hazel is a multi-stemmed shrub that can grow to a height of about 16 feet (5 meters), and can tolerate shade. 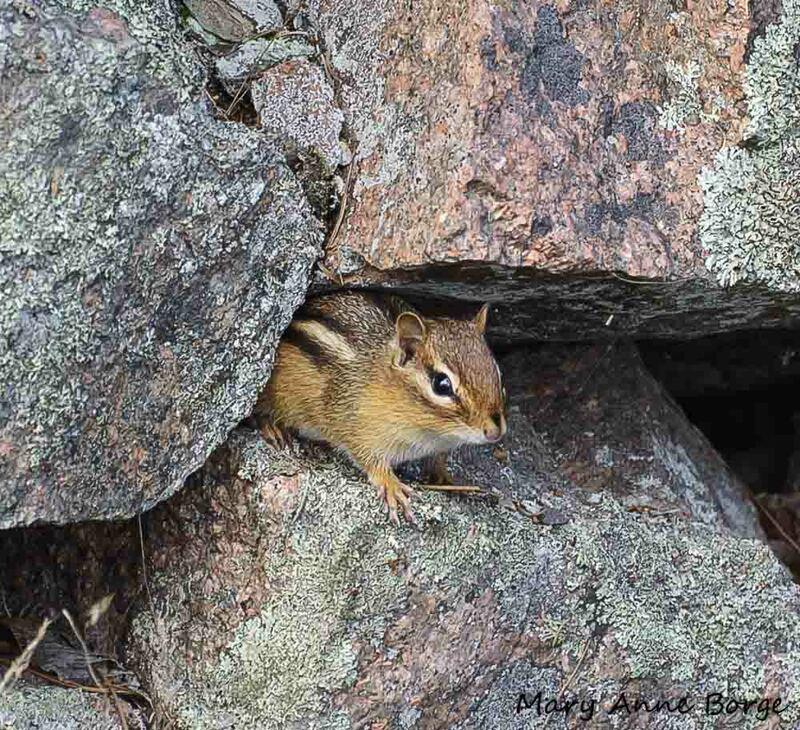 It is native in the Eastern half of the United States, and Ontario, Quebec, New Brunswick and Nova Scotia in Canada. Enjoy these bright blossoms while they last! Williams, Ernest H. Jr. The Nature Handbook – A Guide to Observing the Great Outdoors. 2005.